Resort-style living doesn't have to come with a high price tag when you settle in one of Florida's more affordable active adult communities. These impressive developments often feature amenity-rich clubhouses, beautiful grounds and challenging golf courses. Here are 10 communities, listed in no particular order, to start your search for the perfect Florida golf retirement destination. 1. 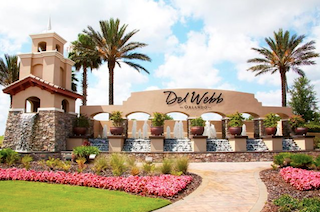 Del Webb Orlando - Davenport, FL Set in Central Florida, Del Webb Orlando has plans for 830 affordable single-family homes. Although it's smaller than many communities, Del Webb Orlando offers an amenity-rich clubhouse, swimming pools, sports courts and the 18-hole Ridgewood Lakes Golf Club. 2. Pelican Preserve - Fort Myers, FL With approximately 2,500 homes in a wide range of sizes and styles, Pelican Preserve offers many affordable options for active adults. The community also features resort-style amenities including a spacious clubhouse, a state-of-the-art fitness center and 27 holes of golf. 3. Tampa Bay Golf & Country Club - San Antonio, FL Active adults on Florida's Central Gulf Coast can find affordable homes at Tampa Bay Golf & Country Club. In addition to its clubhouses, outdoor recreations and 27 holes of golf, the 1,336-home community has a diverse line-up of resale and new construction single-family homes. 4. Arlington Ridge - Leesburg, FL Opened in 2005, Arlington Ridge has plans for a total of 629 single-family homes. A variety of floor plans meet the needs of many homebuyers, while an exciting line-up of amenities support an active lifestyle. Highlights include a spacious clubhouse and an 18-hole championship golf course. 5. Kings Ridge - Clermont, FL Built between 1995 and 2000, by Lennar Homes, Kings Ridge is a well-established community with a welcoming clubhouse, swimming pools, sports courts and an 18-hole executive golf course. Kings Ridge also features 2,088 single-family homes, now available on a resale basis. Solivita in Central Florida is home to countless amenities including the 36-hole Stonegate Golf Club. 6. 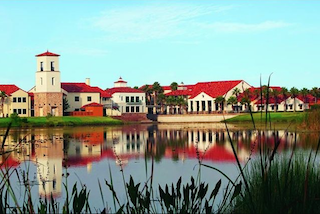 Solivita - Kissimmee, FL Located in Central Florida, just 21 miles from Walt Disney World, Solivita features Tuscan-themed architecture, two 18-hole golf courses and a wide range of resort-style amenities. Upon completion, the community will include nearly 6,000 homes including many affordable options. 7. Spruce Creek Country Club - Summerfield, FL Spruce Creek Country Club, by Del Webb, offers affordable, resort-style living just 15 miles south of Ocala. This impressive 3,250-home community includes multiple recreation centers, a state-of-the-art fitness center, swimming pools and sports courts. Its Eagle Ridge Golf Club also offers four 9-hole golf courses. 8. Stone Creek - Ocala, FL Opened in 2006, Stone Creek is a Del Webb community which has plans for approximately 3,800 affordable homes. Highlights of Stone Creek's exciting amenities include a spacious clubhouse, outdoor sports courts, the Stone Creek Grille Restaurant and the 18-hole Stone Creek Golf Club. 9. Heritage Isle - Viera, FL Heritage Isle began construction in 2006 and plans to have nearly 1,200 residences. With condos, attached and single-family homes there is sure to be a home that fits your style, preferences and price range. Within the community gates there is also a stunning 21,000 square-foot clubhouse filled with amenities and social activities as well as a beautiful 18-hole Duran Golf Course. 10. Indian Spring Country Club - Boynton Beach, FL With over 1,900 residences in a variety of home options to choose from, inspiring amenities, and social activities, Indian Spring Country Club is the perfect place to live greater than your age. You don't always have to pay an outrageous price to experience a great golf community in Palm Beach County, Indian Spring is the perfect example of that. Whether you're looking for a condo, attached duplex or single-family home, it's easy to find affordable options for exciting active adult living throughout the Sunshine State.